TeamConnect Wireless from Sennheiser is the first go-anywhere wireless audio conferencing solution that enables you to set up and host a professional-sounding conference in virtually any room. Because performing teams need to concentrate on the business agenda with technology helping drive progress rather than acting as a distraction. Whether you use Skype for Business, Webex, Gotomeeting, or any other solution, TeamConnect simply connects and provides a neat wireless audio solution. With TeamConnect Wireless Sennheiser has developed an audio conferencing solution for up to 24 participants that can be set up in virtually any room in virtually no time. Ease of use, Sennheiser’s trademark high audio quality, and great design are supplemented by maximum connectivity letting you use your desk phone, mobile phone or your computer to set up a web conference. TeamConnect Wireless is your instant portable conference room. Neatly stowed away in a high-end transport case that doubles as charging station. Just take out the four handy units and place them where you see fit – as close to the participants as needed. No more leaning across the table in order to make yourself heard. 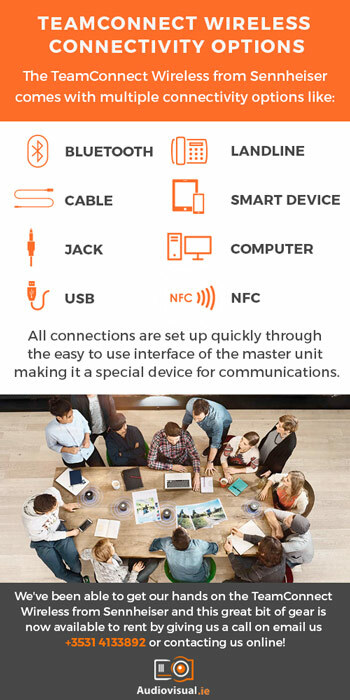 Be it Bluetooth or cable, jack or USB – made for a BYOD world TeamConnect Wireless offers a host of connectivity options. Quickly connect your landline handset, smart device or computer with NFC making pairing with compatible devices effortless. All connections are set up quickly through the easy to use interface of the master unit. Uniquely, TeamConnect Wireless supports multiple simultaneous audio channels, so additional callers can join an ongoing conference at any point by simply connecting another device. Dedicated conference rooms couldn’t be any better equipped. Supreme audio quality is the hallmark of the Sennheiser brand. TeamConnect Wireless is no exception. Its four freely positionable units feature high-class microphones and speakers that ensure excellent acoustic clarity. They allow a simultaneous, natural conversation with great speech intelligibility, which is a real productivity booster for audio conferences. TeamConnect Wireless looks every bit as high-end as it sounds, blending in perfectly with any modern working environment. Crafted from glass and aluminum, coated with a matt black, high-durability lacquer system it radiates class and professionalism. With the intuitive touch sensitive glass control panel of the master unit allowing you to connect devices and control calls. TeamConnect Wireless From Sennheiser Now Available To Rent! We’ve been able to get our hands on the TeamConnect Wireless from Sennheiser and this great bit of gear is now available to rent by giving us a call on email us +3531 4133892, e-mailing me at info@audiovisual.ie or contacting us online!